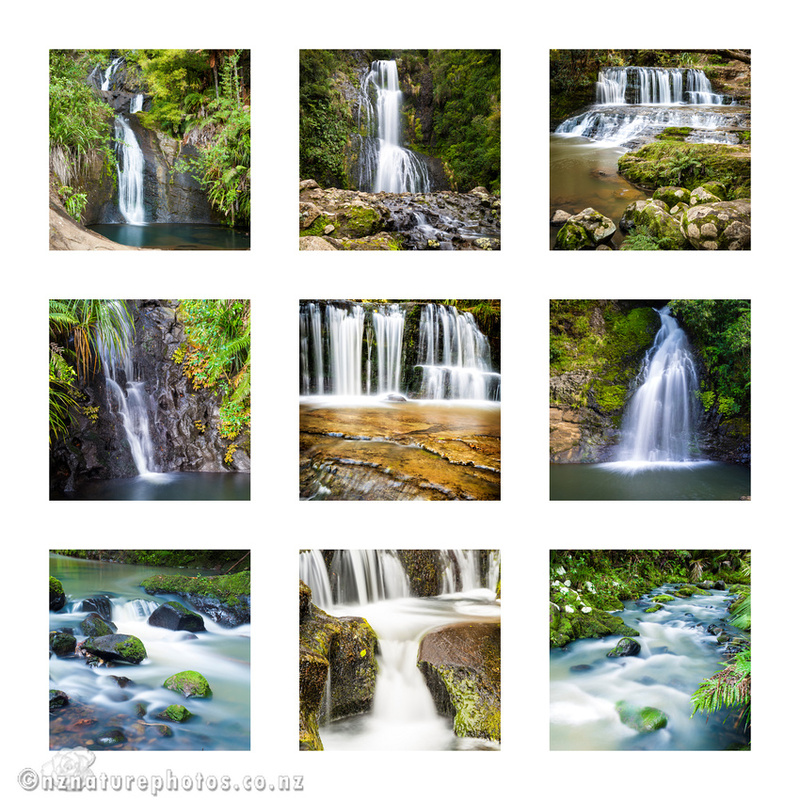 Over the last two years I’ve taken many more photos of waterfalls in the Auckland region. There’s an amount I was never aware of over in the Waitakere Ranges. I’ve visited many of these falls several times. The trick (for photography) is go typically when it is overcast. That way the clouds act as a giant diffusing filter for the sun, and there are less white burnt-out highlights in the waterfalls. The other trick is to avoid too much wind. A semblance of detail in the vegetation is nice. I tend to try to get to location in the morning, and go when other visitors will be rare. Some of the locations are easy to get to. The waterfalls in the Omeru Reserve are a very short walk. Others are a bit more effort, especially when carrying a tripod and a bunch of other photographic gear. I’ve organised 9 of these shots as a collage. The stream shots are at the base of the collage, while the more distant shots are in the top row. If you’re familiar with the area, you should see Fairy Falls, Kiekite Falls, Nihotupu Falls and one of the falls at the Omeru Reserve are represented here. There’s also a lot of long exposure photos here too. All photos taken with either a Sony a900 (24MP Full-Frame DSLR) or Sony a7R (36MP Full Frame mirrorless camera). The collage adds up to a very large file. I have many more waterfall photos on my photography website.